He was a consummate leader, our Legacy. He arrived to our care in September of 2013, master of this group of 3 chestnuts with which he had been matched. We quickly came to recognize his gracious control of the herd as their benevolent dictator. In the last couple of months we noticed signs something might be up, hints that maybe he was aware the end was near. Yesterday morning, Cyndie found him in very bad shape out in the pasture. He had been so uncomfortable he had wrangled out of his blanket, and thus ended up matted with balls of iced-up snow. Whatever was causing him pain, it was now exacerbated by his nearly freezing in the overnight sub-zero cold. Cyndie was able to get him up and walking back into the paddock before coming to get me and contact our vet. Legacy was heroic about letting us attempt to get him warmed up and responding to some meds, but his age, and condition, and the cold all conspired to keep the interventions short of being able to extend his time. After a couple of hours waiting to see if he would feel better, his behavior was very clear. The vet returned and gently guided us through the process of helping Legacy through this transition. 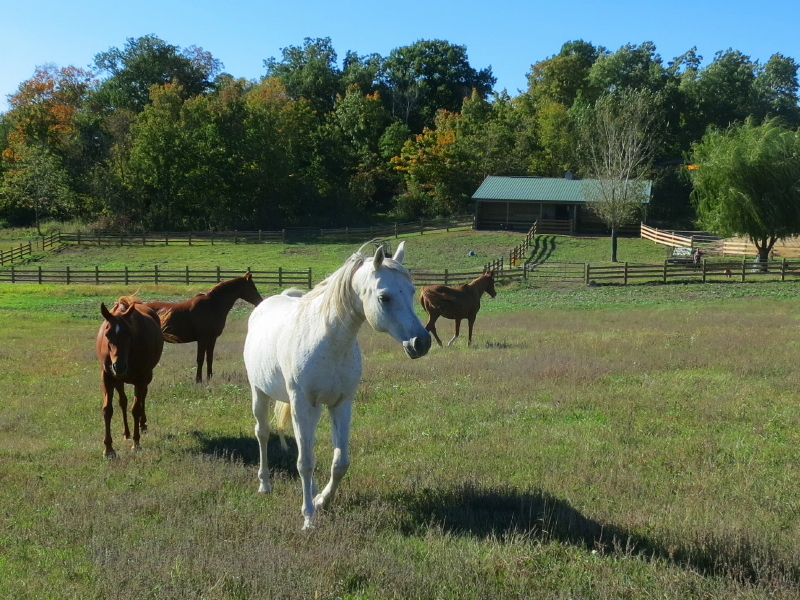 Before the vet arrived, we had walked Legacy out of the paddock to open space in front of the barn. He was pawing the ground in response to pain and so Cyndie walked him to pass the time. He did really well for a brief span, but then picked a perfect spot to stop and calmly lay down. He curled his legs underneath him and sat quietly, no longer needing to paw in pain. He accepted our hugs and condolences and patiently awaited what was to come. When the truck pulled up, Legacy laid his head down, as if fully aware of what came next. His amazing spirit is threaded indelibly throughout every single aspect of Wintervale Ranch, right down to the outline of his face in our logo. There are so many amazing, beautiful memories we have and hold of his time with us. He is irreplaceable and we will be challenged to figure out how to manage the days ahead, guiding Dezirea, Cayenne, and Hunter through their grief, while struggling to cope with our own. Thank you to all of you who are supporting us with your love and kind condolences. Send our horses love. 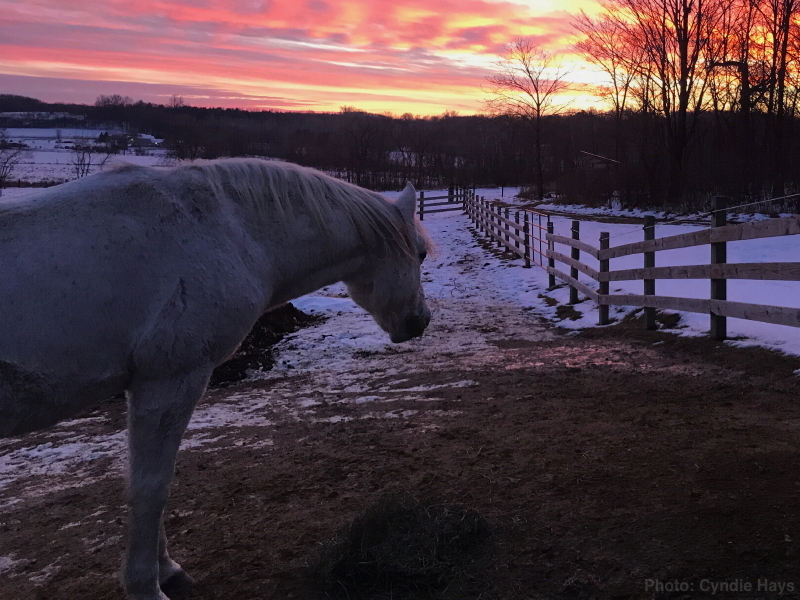 They are visibly disturbed by his departure, yet they mustered strength to provide some loving equine understanding to Cyndie as the vet drove away. Legacy, (7/18/1996-1/14/2018), we send you off with all the love you fostered here, and more. May your spirit soar! Sending heartfelt condolences, my friend. 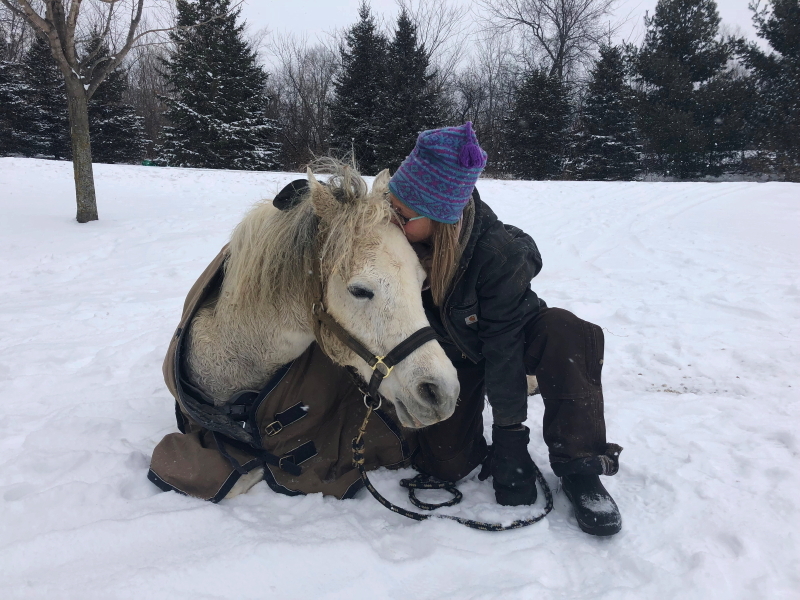 I will never forget when my horse passed…we got him when I was 5 (so was he) and lost him when I was 30…a very long time to share with an animal. I know he felt your love and friendship! Thank you, Lorrie. Legacy left us too soon. Left a BIG hole in our hearts, he did. Thank you so much, Pam, for your words. We are wrapping ourselves in these warm thoughts and love. I miss you! I will make that effort. It is my dear wish that you and John would be able to come visit, maybe making a stop if ever making a traverse to Chicago? By some interesting coincidence, yesterday I was exploring a backup drive and spent time looking at my trek photos again. It was powerful. I don’t know why I don’t do that more often. Noted. We’ll make it a springtime date! The news certainly sent a shudder through me. It is strange how by an absence, a passing, that you suddenly become much more aware of a presence everywhere you look. You almost see the horse again in the spaces where he fitted in so perfectly. You feel that he is with you still. Legacy has truly lived up to his name. How heart wrenching, nevertheless… a hug to you both. Thank you, Ian. So true, …seeing him still in his spaces here. What a beautiful tribute to Legacy. It defines his soul and purpose so clearly. I’m so sorry for your loss, and I wish I could have met him. Love and hugs to you and the rest of your animals. Thank you, Jan. I wish you could have met him, too. It means a lot to me that you picked up on what a special horse he was for us. Thank you for writing. Words are totally inadequate: sending beams to wrap you all in warm light! Many thanks, Ward. The warmth is much appreciated. Thank you, Julie. Receiving the love and letting it wash over us. Thank you, David. You made me laugh while I was crying, with your, Brainerdvale. Love that! I’m sure you are devastated today. I’m so sorry you are hurting and am touched by your tribute. Thinking of you! Yes, devastated is a good word for how we are feeling. I am crying with you both at the loss of Legacy. We have had a few things to be sad over and this is just another very hard example of adjusting to such a special loss. I believe that Legacy was able to communicate to me also and I feel so sad for how you both feel. Thank you, both. I love how he connected with you, Marie. What a wonderful horse, and what a huge loss for you all. My heart sank when I read your post, and Sarah will be heartbroken when she hears the news. Our condolences to you, Cyndie, and the remaining horses. We will be thinking of you in the days ahead. We love you, and hope you will find solace in the memories of the full life Legacy had, and in the gifts he gave to us all. Thank you so much, Rich. It breaks our hearts so to think of all the kids who are learning this sad news today. There was always a special connection between Legacy and kids. May peace be with all of you. I am so saddened by your loss. Thank you, Jim. We are definitely heartbroken over his departure. A ‘peace’ of Legacy lives on in all of us who have shared his energy ❤️ Thank You for sharing him…. Thank you, Judy. He touched countless lives in his brief time with us. So glad you had the opportunity to spend time with him. So sorry to hear of the loss of one of your family at Wintervale. Thank you, Steve. He was such a huge part of the family. Thanks, you guys. I know you understand what it’s like. Thank you, Liz. We are wrapping ourselves in the love. I am so sorry for all of you. That was a well written blog during such an overwhelming time. Love to all. Thank you, Mary. This is definitely overwhelming. Peace to you. Remember the body is only a temporary vessel for a the soul, as souls never die, they are endless. Thank you, George. Legacy’s spirit will forever live on at Wintervale. Oh, John and Cyndie, Dezirea, Cayenne, and Hunter, my heart goes out to you. Sending love. Thank you, Jill. Love is what we need! I am so sorry for your loss of a good and faithful friend. I can only imagine the sorrow that you now feel. Thank you, John. It’s a wallop of loss.